Debating healthcare policy, along with the medical, ethical, historical, statistical and political elements that go into it, can be daunting, to say the least. But my heart and brain lead me to think that it’s not a good sign that the United States is the only industrialized nation failing to provide universal healthcare as a right. Those other countries are probably onto something. And so are all the people, organizations, movements, and politicians who are fighting to make single payer a reality. 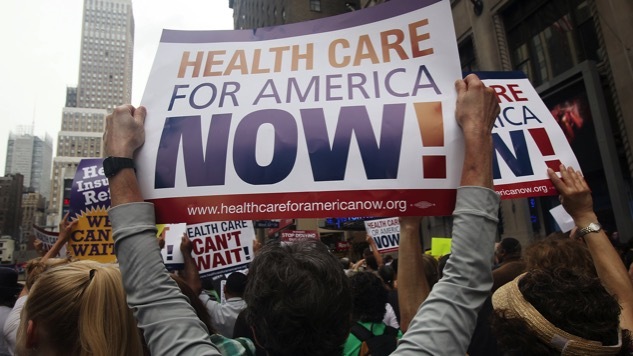 The recent implosion of Trumpcare has only emboldened the single payer movement, which is looking more and more like the only viable alternative to the status quo, or worse. A National Day of Action for Improved Medicare for All has been called for Saturday, April 8th. Congressman John Conyers [MI-D], has picked up so many co-sponsors for his single payer bill, which he re-introduced in January, that he tweeted out, “As I work to convince my fellow Dems to support #MedicareForAll, I thank the GOP for (unwittingly) helping out!” And Senator Bernie Sanders will be reintroducing his Medicare for all bill too. Support for single payer is at an unprecedented level. But not everyone is so enthusiastic, of course. And the opponents of single payer include insurance companies, lobbies, Republicans and a certain subgenre of Democratic hacks who either genuinely reject universal healthcare programs or who harbor a hatred of Sanders that eclipses their empathy for people whose health and lives are threatened by having inadequate health insurance or no health insurance at all. Their aversion to a single payer plan, they would like us to believe, is based on pragmatism and common sense. (See, for example, this Eric Boehlert tweet, as well as all the people who hearted it, retweeted it or otherwise cosigned it.) Those of us who support single payer, they claim, are naive, radical purists obsessed with a program that will never work in these United States! We just don’t know what we’re talking about. But Dr. Adam Gaffney definitely knows what he’s talking about. Gaffney is a pulmonary and critical care physician, instructor at Harvard medical school, a board member and secretary of Physicians for a National Health Program and an advocate for a universal single-payer health care system. Gaffney’s writing focusing on policy, politics, and health care history has appeared in The Guardian, The New Republic, The Los Angeles Review of Books, USA Today, Salon, CNN.com, Dissent, US News & World Report, Jacobin, In These Times. And he is working on a book that explores healthcare as a human right. Somehow he managed to squeeze in an appearance on the Katie Halper Show, where he debunked common single-payer-phobic myths for me and my co-host, Gabe Pacheco. Below are among the most pervasive—and annoying—myths followed by Dr. Adam Gaffney’s insights. The interview has been edited for clarity and length and includes follow up questions. It’s not going to be easy, but there’s no question that it can be done. There has been a growing wave of support and a growing movement that has come a long way. Even after Trumpcare imploded and went up in flames, the immediate reaction you heard from voices across the political spectrum was this is going to open the door to single payer. I’m usually the one always making that argument. I didn’t even need to make it this time because everybody else was saying the same thing. Obviously, the health insurance industry is not really going to go along with this. In fact, they are going to fight it to the death because this would really decimate the private health insurance industry. We should just be honest about that. I don’t think that’s an insurmountable obstacle, but they are a force to be reckoned with . . . The pharmaceutical industry is going to be opposed as well. Not to the same degree as the insurance industry but one thing that is good about a single-payer system is that you can negotiate down drug prices on a national level, which already happens in other countries. You could probably bring brand-name drug prices down by about 50% that way. We’re already seeing movements coalescing behind the idea that single payer is in fact the last man standing, the only option left. There’s such a massive disassociation between the right-wing healthcare ethos and what people actually think, even Republicans. I think healthcare, along with certain other social goods, we conceive of them in a different way. Healthcare, education, a number of other things are not simply commodity goods. You can make them into just one more commodity, but it’s a hellish result that you get from it. If you really made healthcare into the equivalent of a car, then that would mean that everybody who doesn’t have a car today would be dying because they wouldn’t be able to go to the doctor. People would be dying in the street; you could turn people away from hospitals; you could turn people away from emergency rooms. There’s just a general philosophical sentiment against that. No one wants to think that the reason they’re being treated or not treated a certain way is for some corporation’s bottom line. To misquote John Lennon, we can imagine a world without health insurance companies. It’s not hard to do. And once we accept that logic, the feasibility becomes clearer. What we’re proposing is an ambitious, grand and egalitarian new system. It’s gonna cost money, but we have savings on the flip side. I’m not worried about losing the battle over finances. [The case for single payer] took a hit during the primary campaign. Bernie Sanders came out with a sort of single payer proposal and there were these estimates put out by an economist and everybody jumped on the bandwagon, like Paul Krugman, and Ezra Kein, who called it a “puppies and rainbows” plan. Powerful pundits, for better or for worse, have an influence on policy and on Washington. They are actors in this game. It’s enraging. When they say: “Oh, single-payer is great but it’s not doable,” they are contributing to its lack of doability because people respect their columns. I don’t want to overstate their importance in terms of Washington, but to whatever extent they matter, they are contributing to the infeasibility that they say is inevitable. But we have the numbers and they’re on our side. The administrative savings alone are estimated to be about $500 billion [$503.6 billion] per year because if you go to single-payer systems like Medicare, you can basically cut out a ton of wasteful spending on billing insurance overhead, profits, all of this nonsense. Then you toss in another $100 billion [$113.2 billion] in pharmaceutical savings. And then you’re talking about real money at that point. You can use that money to cover the cost of insuring everybody and of getting rid of copayments and deductibles, and expanding coverage in new ways like dental care and long-term care, things insurance often already doesn’t cover. The argument that it would’ve been easier to do earlier is that you wouldn’t have this whole apparatus that you need to deal with. When the U.K created their National Health Service in 1946, there wasn’t this massive, powerful insurance industry; there wasn’t as massive of a powerful pharmaceutical industry. It would’ve been easier in some respects. That being said, Truman did have a bill for a sort of single-payer-like, national health care system. And that was actually defeated by doctors. The American Medical Association went McCarthyite-crazy on it and sunk it, called it Leninist. We can send people to the moon, we can create Medicare for All. It’s really not that complicated. Myth #4: Single payer is such a bad system that Canadians come to America to seek out superior treatment! The “Canadians coming to the U.S. because they can’t get healthcare in Canada” thing comes up a lot. And there’s actually really no evidence to that at all. It’s a myth. First of all, they couldn’t afford it. If you wanted to come to the United States and get a heart transplant it would cost you millions of dollars. So I don’t know who these Canadians are who have all this money that they would come to the U.S. for something they can get for free in Canada. A study came out a week or two ago on Cystic Fibrosis, which is a debilitating, genetic lung disease that is often or mostly fatal. It found that people with CF live ten years longer in Canada than they do in the United States. Not only that, they got more lung transplants in Canada than they got in the United States. We’re supposed to be the reigning gods of high-tech care. That’s supposed to be our speciality. There are always anecdotes about people who are unhappy in other countries. I don’t deny that people have had bad experiences with other systems; you’re dealing with human beings and you’re dealing with different on-the-ground experiences. My answer is as follows: you can take what’s best about American health care now, there are great things about it, and combine that with the best ideas that come from international examples. Between the two of those, we can actually have a really superior healthcare system. Ross Douthat had a recent column claiming that insurance coverage doesn’t actually save lives. What he says is nonsense. He only cited two studies. One showed lives were saved. The other did not show a statistically significant benefit but it was way too small to actually do so. He didn’t cite the full expanse of the literature. There’s a lot of studies that have looked at the association of being uninsured, and of dying prematurely. There’s a body of literature supporting the notion that people who aren’t insured wind up dying at higher rates and if you cover more people you actually save lives. Each study shows different numbers but for somewhere between every 300 and 1,000 person you insure, you save one life per year. So if you have 28 million uninsured people, which is what the case is now, even with the Affordable Care Act, there are probably tens of thousands of people dying a year whose lives could be saved if we moved to single-payer. That’s a sobering thought. And it also brings home the idea that American healthcare is not already great, and why the ‘America is already great’ line didn’t really work well for some people. Another issue is drugs: there’s been a big rise in drug prices, there’s been a proliferation of extraordinarily expensive drugs costing hundresds of thousands of dollars a year. There has been a rise in deductibles, in co-payments. And, as a result, people skip their medications, or they take twice a day medication once a day. Or they don’t even fill the prescription to begin with. There was a heartbreaking story on NPR about people with cancer skipping therapies because they couldn’t afford it. It’s terrible. And we don’t need it. In the UK, in Wales, Scotland, Northern Ireland, except for in a small minority of cases in England, they don’t have any co-payments for drugs. So any drug you’re prescribed by your doctor can be filled for free. And we can do the same thing here. But first of all, something is going to be impossible if you believe it to be so. It’s a self-fulfilling prophecy. Second of all, it’s not impossible. A Gallup poll of last year found that 58% of the country supports single-payer. It takes a little bit of gumption to claim that something that the majority of the country wants isn’t feasible. That says something sad about the way democracy works. Someone could make the critique, “Why are we possibly talking about single payer right now? Trump is in office, Republicans control congress. What chance in hell do we have now?” My response to that would be that now is the time when we coalesce around policy, make the Democratic Party take on that policy and be ready so that when there is a turn in power, when there is a change in government, we can actually make it happen. Single payer really has the potential to be a unifying issue. People want more health care, not less. They want their parents and their children and themselves to be taken care of. People’s lives are on the line. And it’s a way to move against a lot of other forms of oppression in society including racism. Having a single tier won’t solve racism but it’s a step in the right direction against racial injustice. Sanders is obviously a long-time single payer supporter. Sanders introduced single payer bills in the past. The healthcare issue was a big part of the primary between him and Clinton. And that helped contribute to the overall dialog that’s been brewing where single payer is increasingly being pointed to as the next step that the Democrats should take on. In response to the Trumpcare fiasco, Sanders is going to introduce a new single payer bill. And it actually opens up a big area for activists because now we have all the Democratic senators or Republican senators that we can pressure: “Sign on to Bernie’s bill. Why aren’t you signing on to Bernie’s bill? What is your reason for not doing that?” And Rep. Conyers has had a single payer bill which he reintroduced in January. So we have a bill in the House currently. And Bernie is going to re-introduce a bill in the Senate. Having those bills out there, even if they lack enough sponsors provides an important organizing focus and will help lead us into the realm of actual policy once we change the people who are in charge of the country. And the grassroots movement is playing a critical role. I think all these elements are going to come together and bring victory.